An outstanding biography of one of the great spiritual teachers written by one who served as his assistant for 34 years and became an outstanding spiritual teacher in her own right. The book is outstanding because it provides a first-person account of his life, but also because as we read along, we absorb his teaching, as well as experiencing these teachings embodied in a very busy, productive life. A large collection of photographs adds richness and meaning. Biography of Swami Paramananda (1884-1940), his work and contribution to Western Vedanta. A Bridge of Dreams reveals the story of Paramananda's life and community. Rarely has an historian had such unrestricted access to the diaries, letters and intimate accounts of a spiritual teacher and his disciples. Their finances, frictions, and the love they shared are candidly portrayed in this epic of the spiritual life. Here is no facile philosophy, no esoteric tricks, but the true story of how one ardent soul used the common problems of twentieth century America to prove "Love Conquers All." As a member of one of the oldest spritual communities in America, Srimata Gayatri Devi became its head in 1940. During her fifty-five years of spiritual leadership, she experienced all the possible challenges and trials of community life. In the sixty-seven years since her coming to the United States, she has shared with countless seekers not only the tenets of her philosophy, but the richer gift of her example in living. One Life's Pilgrimage presents her talks on practical aspects of Vedanta and her articles on the lore, culture, sacred stories, and saints who have inspired her. Through her letters, which are full of cousel and direction, the reader will follow a life unique in its unfoldment. 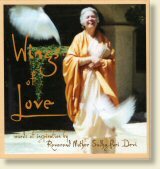 Collection of quotes taken from sermons and classes given by Reverend Mother Sudha Puri Devi with photographs taken at the Vedanta Centre, Cohasset and Ananda Ashrama, La Crescenta. From the Book: You can find God in the soul of every person you meet, every soul in your life. Your eyes are the Divine Eyes looking out at things. Your heart is the Divine Heart embracing, loving. Everyone's eyes that we look into, the Divine is shining through those eyes looking at us. Every heart that loves us and embraces us is the Divine Heart. 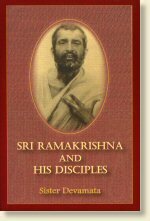 Sister Devamata, author of this remarkable record of one of India's lofty Spiritual Lights, Sri Ramakrishna, had rare opportunities to gather material from the direct disciples and she possesses an equally rare gift of being able to lend to her portrayal exceptional beauty of literary form. Her picture is a true one and is drawn with great delicacy of feeling. Her first hand knowledge leaves a profound impression on the heart and life. This book cannot fail to bring about a better understanding of India and a broader sympathy for humanity at large. 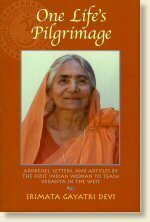 Includes a brief biography of Sister Devamata. 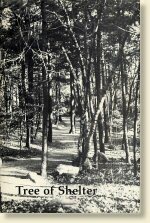 A journal of Sister Devamata's (1867-1942) pilgrimage in India from 1909-1911. Introduced to Vedanta by Swami Vivekananda in 1899 and editor of many of his works, she was sent to India by Swami Paramananda to sit at the feet of Holy Mother, Sri Sarada Devi and Sri Ramakrishna's other direct disciples. 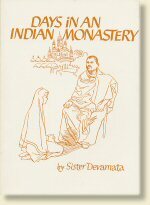 This book of spiritual poems was written by Sister Devamata, the first American woman ordained to teach Vedanta in the United States. Ordained in 1910, she became a major figure in the early history of Vedanta in the United States. A mystic of the first order, she expressed her love for the Divine through poetry, music and inspired writing. This book, Open Portal, is a collection of evocative poems calling forth the Divine spirit manifested in nature, the garden, the desert, the hills, the seasons and the play of life itself. 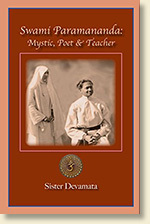 A personal journal of Sister Daya's (1882-1955) monastic training under Swami Paramananda. From the Introductionr: During her early years as a novice, the Sister kept a diary of the instruction and discipline received from her teacher, and also of her personal struggles. She wrote: "Eager not to lose a word, not a shade of meaning, I trained myself to hold in my memory vagrant conversations so that afterwards I could write them down with a fair degree of accuracy for future reference. I was not wholly successful, yet it was amazing how in time it was possible to recall the very words and phrases of my teacher and how this power grew as it was put into practice." 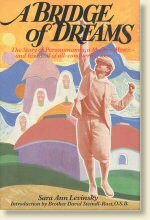 The history of Ananda Ashrama in California, founded by Swami Paramananda in 1923. A beautiful presentation of the story of the founding of Vedanta Centre in Boston (1909) and the ashrama in Cohasset (1929) by Swami Paramananda. 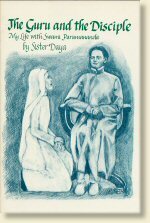 Contains quotations by the founder and Reverend Mother Gayatri Devi regarding the ideals of the work.